To determine the effect of breed on growth performance and carcass characteristics in Mexican hair sheep, 48 lambs (average 38.9 ± 1.56 kg body weight, BW) were used in a completely randomized experimental design. The breed types assessed were 16 Pelibuey (PB), 16 Pelibuey x Katahdin (PB-KT) crossbred and 16 Pelibuey x Dorper (PB-DP) crossbred lambs. The lambs were fed a maize grain-based diet (88% concentrate and 12% forage) containing 155 g CP and 12.13 MJ ME/kg DM. The growth performance trial lasted 45 days. The average daily gain was significantly higher for the PB breed than for the PB-KT and PB-DP cross-breds. Feed intake in the PB and PB-KT was significantly higher than in the PB-DP. The feed conversion ratio was lower for the PB than for PB-KT and PB-DP lambs. Hot carcass dressing and leg perimeters were significantly lower for the PB than for the PB-DP lambs, and similar to that of the PB-KT lambs. The lowest dorsal fat values were measured in the PB breed, compared with both the PB-KT and PB-DP cross-breds. Mesenteric fat (as % of BW) in the PB was significantly higher than in PB-KT and PB-DP lambs. Empty rumen and small intestine weights (as % of BW) in the PB lambs were significantly higher than in the PB-DP lambs, but their large intestine was significantly smaller than in the other two breeds. It was concluded that the PB lambs have a better growth performance and carcass characteristics than the PB-DM lambs, but similar to that of the PB-KT lambs. The sheep industry in Mexico is characterized by a high demand for mutton. With a reduction of production costs in mind, many wool sheep producers have diverted from wool production and incorporated hair sheep into their sheep production systems. Hair sheep breeds are generally smaller in size and have lower growth rates than more traditional wool breeds, but are described as hardy animals with the ability to perform and produce under harsh conditions (Wildeus, 2006; Wildeus et al., 2007). The hair sheep breed mainly found in Mexico is the Pelibuey, which is kept for meat production because it is well adapted to the hot, humid climate found throughout much of the tropics (Gutierrez et al., 2005). However, its productive performance is inferior to that of other specialized meat producing breeds (Notter et al., 2004; Partida de la Peña et al., 2009). 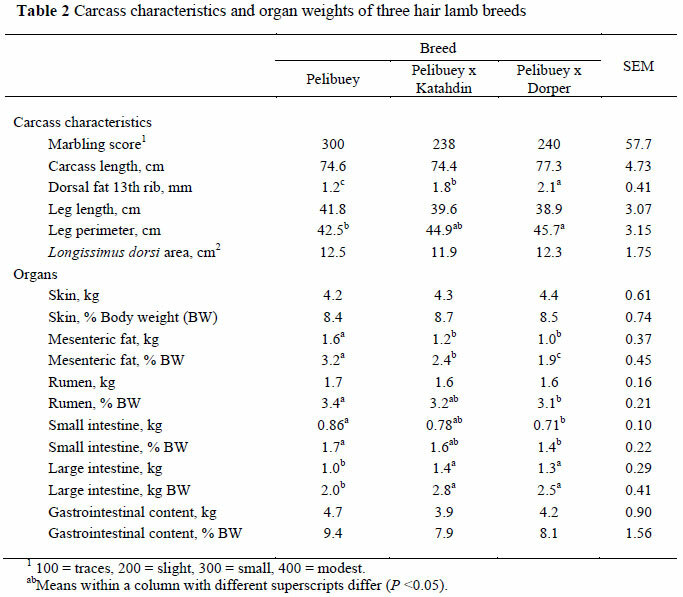 Recently, hair breeds specialized for meat production, such as the Dorper and Katahdin, have been used extensively in tropical areas to improve the weight gains of Pelibuey lambs (Canton & Quintal, 2007). The Pelibuey and hair cross-breds grazing in the tropics, have shown weight gains of less than 75 g/d (Piñeiro-Vázquez et al., 2009), but if fully confined or their diets complemented with concentrates, they achieved average daily gains (ADGs) of 191 to 218 g (Pineda et al., 1998; Greiner & Duckett, 2005; Wildeus et al., 2005; Galina et al., 2007). However, characterization of carcass merits is lacking for these breeds. It was hypothesized that the growth performance of the Pelibuey sheep breed, when confined and fed grain-based diets, is similar to that of the Pelibuey crossed with composite breeds such as the Katahdin and Dorper. Therefore, the objective of this study was to determine the effect of breed on growth performance and carcass characteristics in Pelibuey (PB), Pelibuey x Katahdin (PB-KT) and Pelibuey x Dorper (PB-DP) lambs. The experiment was performed at the Medical Veterinary School of the Autonomous University of Sinaloa, Mexico. The climate is classified as semi-arid, i.e. dry and extremely hot in summer, with summer, the rainy season. The animal experimental procedures were approved by the Academic Committee of the Animal Science Department according to animal regulations enacted by the State of Sinaloa, México. Forty-eight male lambs, six months of age with an average body weight (BW) of 38.9 ± 1.56 kg, were used in the experiment; 16 of the lambs were Pelibuey (PB), 16 Pelibuey x Katahdin (PB-KT) crossbreds and 16 Pelibuey x Dorper (PB-DP) crossbreds. Data was analyzed in a completely randomized design with each group (treatment) having four replicates. The experiment lasted 45 days, during which the animals received a total mixed ration (155 g crude protein and 12.13 MJ metabolizable energy/kg dry matter of 65% maize grain, 12% Sudan hay, 11.7% soybean meal, 7.0% sugar cane molasses and 2.7% of a mineral premix. The following variables were measured: BW, feed intake, ADG and feed conversion ratio (FCR). At the end of the experiment the lambs were fasted for 16 h and slaughtered, and the skin and hot carcass weights were recorded. At 24 h post mortem the following data was recorded: chilled carcass weight, a sample of the longissimus dorsi from the loin at the 12th rib on which surface area was measured in cm2 and a marbling score done, 100 = traces, 200 = slight, 300 = small and 400 = modest (Jackson et al., 1997). Dorsal fat thickness (mm) at the 13th rib was measured and the mesenteric fat (kg) was weighed. The empty weights of rumen, small and large intestine were measured, and the gastrointestinal content was analyzed. The dressing percentage was calculated as carcass weight divided by slaughter weight, multiplied by 100. In the chilled carcass other morphological measures were determined: total carcass length, and leg length and perimeter, as described by Fisher & de Boer (1994) and Ruiz et al. (2000). Data was analyzed as a completely randomized (8 lambs per treatment) design. Initial BW was considered a covariate but was excluded (P >0.05) from the model. Monthly means for BW changes, ADG and FCR were analyzed using the Mixed procedure of SAS (1994). The Tukey test (SAS 1994) was used to compare means. Differences between treatments were considered significant at P <0.05. The ADG was higher (P <0.05) for the PB breed than in the PB-KT and PB-DP crosses. Feed intake in the PB and PB-KT was higher (P <0.05) than in the PB-DP. Thus the FCR was lower for the PB lambs than for the PB-KT and PB-DP lambs. Hot carcass dressing percentage was lower (P <0.05) for the PB than for PB-DP lambs, but similar (P >0.05) to the PB-KT lambs (Table 1). Furthermore, leg perimeters were lower (P <0.05) for the PB lambs than for PB-DP, and similar (P >0.05) to the PB-KT lambs. The lowest (P <0.05) dorsal fat values were measure in the PB lambs, compared with both the PB-KT and PB-DP lambs. The mesenteric fat (as % of BW) was higher (P <0.05) for the PB than for the PB-KT and PB-DP lambs. The rumen and small intestine, as % of BW, in the PB breed were higher (P <0.05) than in the PB-DP cross, but the large intestine was smaller (P <0.05) in the PB than in the other two breeds (Table 2). Average daily weight gain for the PB breed was higher than those found by Horton & Burgher (1992) for Katahdin (0.267 kg/d), Dorset (0.246 kg/d) and St. Croix (0.234 kg/d) lambs, but their findings agree with the results found for the PB-KT and PB-DP crosses at the final productive stage (Phillips et al., 1995). However, a previous study showed that the ADG of Pelibuey, Dorper x Pelibuey and Katahdin x Pelibuey averaged 0.232 kg/d with no differences between those breeds (Canton & Quintal, 2007). Our research findings confirm that when hair lambs are fed diets containing high levels of concentrate, they are more efficient in their productive performance, even when reared in hot regions, as was demonstrated previously (Schilling, 2005; Wildeus et al., 2007). The recorded average feed intakes in this trial for the three breeds (1.33, 1.32, and 1.23 kg/d) were very close to that reported by Canton & Quintal (2007) and Pérez et al. (2008) in hair lambs (Dorper x Pelibuey, 1.27 kg/d; Katahdin x Pelibuey, 1.18 kg/d; Pelibuey, 1.14 kg/d). Due to the lower mature body weights of the PB breed than the PB-KT and PB-DP crosses, one can theorize that the FCR would be lower, particularly on high-grain diets (Wildeus, 1997). Several studies have found that Dorper lambs have higher carcass weights than other hair lambs such as the Katahdin (Shackelford et al. (2005). Bunch et al. (2004) evaluated several hair cross-breds and found that the hot carcass weight was 26.8 kg in Dorper lambs which is close to that found for the Pelibuey lambs (28.4 kg) in the present study. 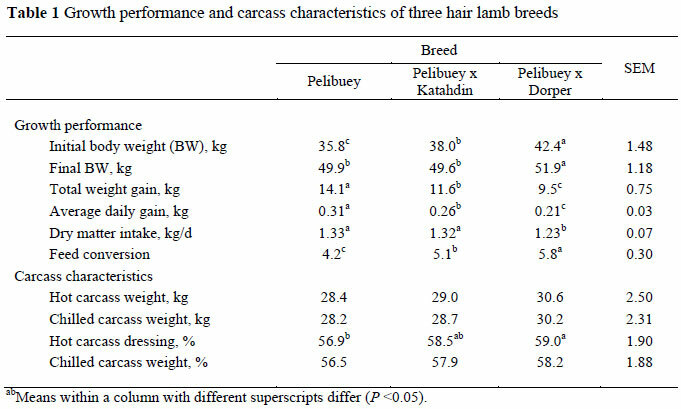 However, when comparing carcass traits of different hair breed lambs under an intensive feeding system, there were no differences in hot carcass weight (Burke et al., 2003); their averages are similar to those found in the present study. The hot carcass dressing values observed for the PB-KT and PB-DP crosses in this study are similar to those found by Castro et al. (2007) for the cross, Pelibuey x Dorset (59.5%), slaughtered at a 45.9 kg body weight. The averages found in the three breeds in the present study can be considered excellent because they are higher than the results recorded by Pérez et al. (2008) who found hot carcass dressing values of 53.8 and 52.5% for Dorper and Katahdin lambs, respectively. The surface area of the longissimus dorsi measured in the present study for the three breeds, is less than the 14.1 cm2 reported by Horton & Burgher (1992) in Katahdin lambs, which is similar to that observed by Castro et al. (2007), who measured a value of 19.4 cm2 in a Pelibuey x Dorset cross. Godfrey & Weis (2005) registered a longissimus dorsi area of 10.4 cm2 in the cross, Dorper x St. Croix, similar to the results found in the present study. Regarding dorsal fat values: Burke et al. (2003) recorded 7.5 mm in cross Dorper x St. Croix lambs, and 5.9 mm in the Katahdin. In the Dorper and Katahdin, Shackelford et al. (2005) measured dorsal fat thickness values of 8.38 and 7.62 mm, respectively. However, in the cross, Dorper x St. Croix, Goodfrey & Weis (2005) recorded the dorsal fat to be 1.5 mm. This value is close to the values found in the present study. Marbling in the longissimus dorsi of the PB lambs was considered low, and for the PB-KT and PB-DP crosses it is defined as slight. This is lower than the value observed in wool lambs whose marbling score is modest (Jackson et al., 1997). Leg length was longer in the PB than in the PB-DP lambs, but leg perimeter was larger in the PB-DP and PB-KT than in the PB lambs. This data is in agreement with Bianchi et al. (2006a; b), who found that lambs with heavier weights have higher values for leg perimeters. In the present experiment it was observed that the gastrointestinal content influenced carcass performance. Lambs with heavier weights had lower carcass performances because they had higher gastrointestinal contents (kg). Mesenteric fat was higher for the PB lambs than for the PB-KT and PB-DP lambs. Bores et al. (2002) found for cross-bred lambs a value of 1.29 kg. This result is similar to that of the for PB-KT and PB-DP lambs in the present study. Skin weight was similar for the three breeds, contrary to the findings of Silva et al. (2006) who reported values of 11.9 and 13.0% for Dorper and Katahdin lambs, respectively. The rumen, and small and large intestine weights influenced carcass performance in Pelibuey lambs negatively. The fact that the PB lambs had a better growth performance than the PB-KT and PB-DP lambs can be partially attributed to the stressful tropical environment conditions in which PB lambs are better adapted to (Wildeus, 1997). Under the present experimental conditions, it is concluded that PB lambs had a better growth performance than PB-KT and PB-DP cross-bred lambs. The cross-breeds, PB-KT and PB-DP, however, had more favourable carcass characteristics than the PB breed.